Humans love a challenge. Throw down a gauntlet, and someone will step right up. A few hundred years ago there were great challenges to be embarked upon. The Northwest Passage, circumnavigation of the globe, settling the wild frontier of the New World, establishing the Oregon Trail, climbing to the summit of Everest, building the transcontinental railroad. Nowadays, the great challenges lie entirely with experts. Scientists and Medical researchers. Landing on a comet, bringing samples back to earth. Finding cures for life-threatening diseases. Planning a manned mission to Mars. Back in the old days, anybody with a boat and a patron could set sail for adventure. In my modern, comfortable, automated, mechanized life in the richest country in the world, it seems the greatest challenge sometimes is balancing the checkbook or sealing the drafty windows for winter. Unlike times past, there’s little worry about heat, food, shelter, money, transportation. And so, I must invent my own challenges. Winter is one. Not just surviving the winter shuttered in our rooms, sipping hot tea by the fire. Embracing winter. Winter is a test. A test of fortitude, endurance, maybe sanity. I love the test. Getting out in the Magic of winter is a challenge, but the rewards are many. For one, there’s a standing promise to my dog, Chuy, that we will go out for a great hike whenever we can. This is often as much a challenge for him as it is me. This year, the snow piled up. Fluffy, soft snow. For the first half of the winter it was average, and good hiking. 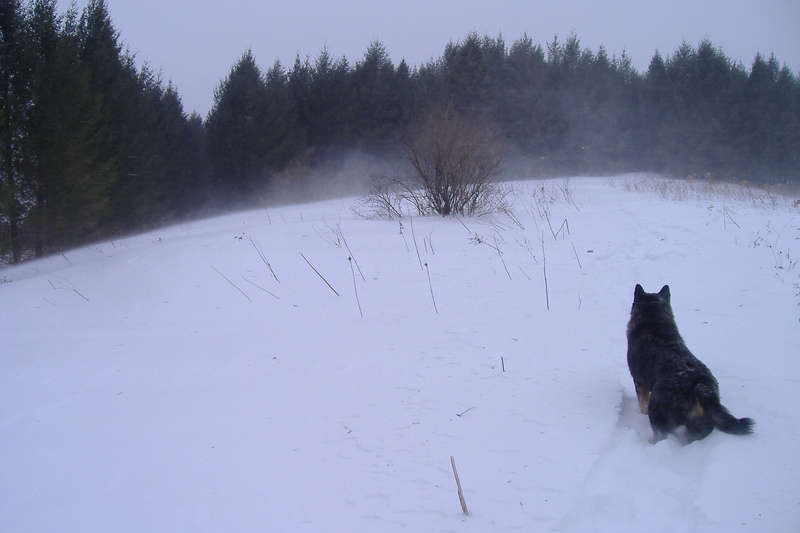 By the second half, the snow was still fluffy, and deeper than the length of an Akita’s legs. Stepping off the trail at the wrong point would plunge Chuy into snow up to his shoulders. Granular & powdery snow, like quicksand. 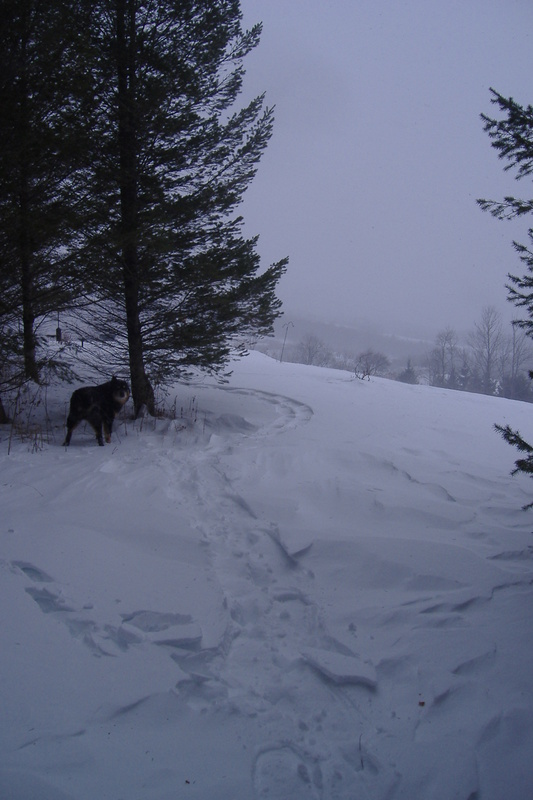 More than once it was necessary to strike the path and cut a snowshoe trail to the floundering dog. I’m sure he would eventually swim his way out, but he’s older than I am (in dog years) and I can’t watch him struggle too much. There’s also the cold, and in his golden years, Chuy’s feet don’t tolerate the sub-zero temperatures for long, and he’ll start lifting a paw. It’s actually two paws. His left front and right rear. We don’t hike when the temps are below 8 degrees. Getting out into the winter is work. Boots, snowsuits, snowshoes, and gloves, gloves, gloves. Hats & scarves. That’s just another part of the test. Willing yourself to step out the door is another. Once outside, the beauty of the season is all around. The sky seems bluer, the snow brighter. 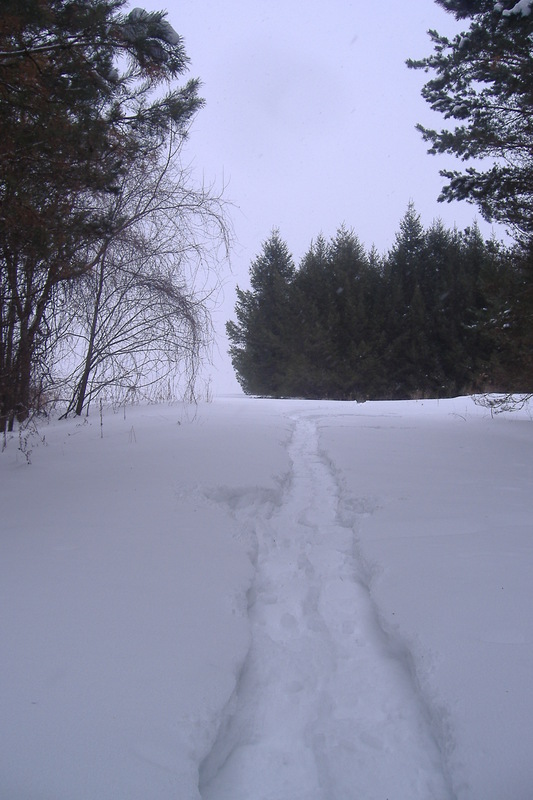 The winds whip up snow devils, dust the snow from pine boughs, blow drifts three or four feet deep across our snowshoe trail to the top of Nishan Hill, and beyond to the edge of the hardwoods. 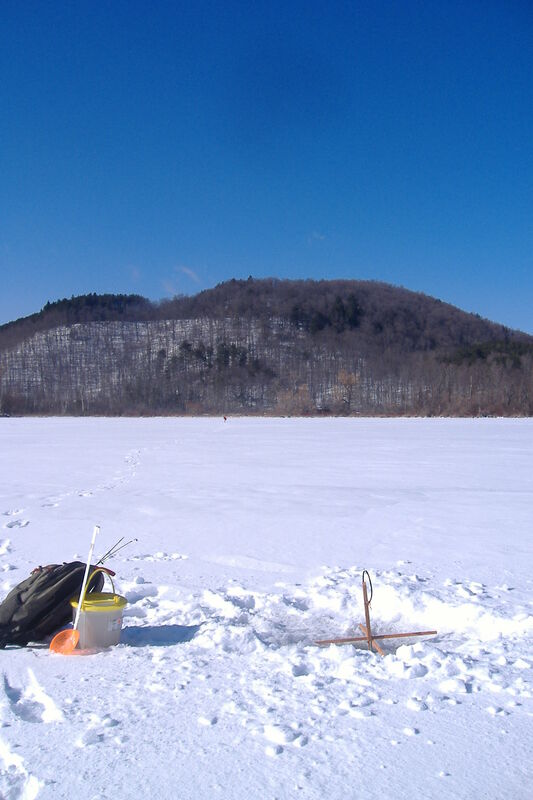 I’m disappointed that I didn’t get more ice fishing in this winter, and now the season is over. It’s another challenge. To be out there, in the elements. To drill through fourteen inches of ice and set a tip-up line, five in a row. To feel a fish on the end of your line, while standing above the water, as far away from summer and boats as you can be. To pour hot coffee from a Thermos, the steam rising, committed to activities in the 15-degree air. To reach down through the frozen pond and pull up a meal. A challenge and reward in one. I was alone on the pond in January, when I pulled a couple pickerel through the ice. Between flags, I’d listen to the quiet, study the snow-dusted mountains, observe the bright blue sky, vast expanses of ice, forests all around. There’s a difference between isolation and solitude. We finally got a couple of snowmobiles going this year, another good activity to get us out of the inside and into the outside. When I was growing up, my Dad was mad about snowmobiles. They weren’t as sophisticated (or expensive) back then, but they were every bit as much fun. A couple years ago, my Dad gave me his last sled, an ’83 Arctic Cat Jag 3000 F/C. 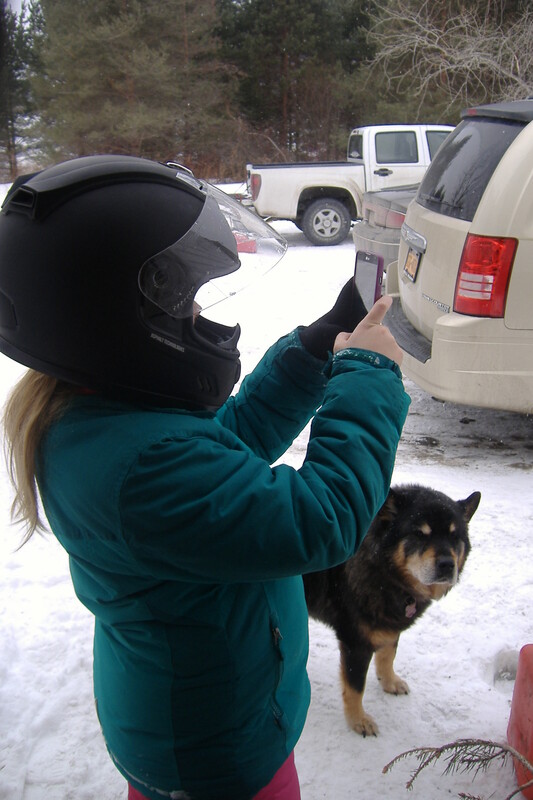 This winter, though the snow wasn’t perfect, my son-in-law brought his sled and his kids (grandson Max and granddaughter Elizabeth), and we spent a day riding the sleds around the same trails Chuy and I walked so frequently. 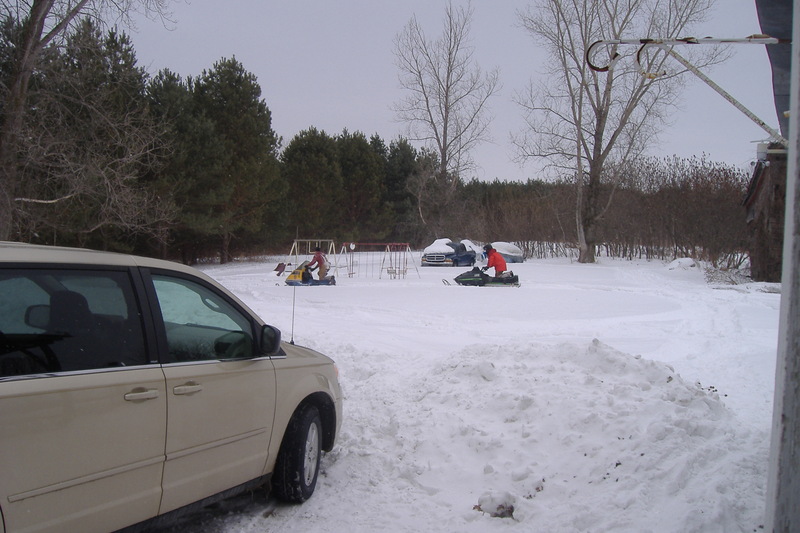 Getting a 400 pound snowmobile unstuck out of three feet of powdery snow is quite a challenge, and lets you know which muscle groups you need to tone. We had hours of good old-fashioned fun, and I don’t think we ever noticed the cold. Funny how that happens. Here we are nearing the end of March already, and, like last year, I feel a certain sadness that the snow is leaving for another year. Last year I did a post called So Long Snow, in which I expressed the same lament. Having survived and thrived, we immersed ourselves in the challenging season, and came out feeling accomplished. We didn’t just live through winter, but lived it! We’ve passed The Test for another year.